Using smoking woods with a smoker box to produce aromatic and flavorful smoke is a great way to enhance your barbecue cooking. Particularly if you have a gas grill or a natural gas grill, this is one grill accessory you should not go without! Smoking woods - Many different types of hardwood firewoods produce distinct and aromatic smoke which can infuse your food with great flavors. 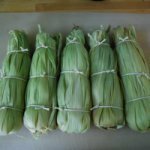 Mesquite and hickory are the most popular but others like apple, cherry and alder can all add unique flavors to augment your raw ingredients. For more information on types of smoking woods see my Smoking Wood page and to learn how to use it with your grill read on and also check out my Smoking Box How To page. Why use a smoker box? - A smoking box is basically a metal box with a lid and holes in it. Its purpose is to hold smoking wood chips or chunks in your grill and let the savory smoke that is produced out to surround your food. Frankly, if you have a charcoal barbecue or a smoker you don't need a smoking box to use smoking woods, although some people still prefer it. However, if you have a gas grill or natural gas grill, a smoking box is an absolute necessity! Without smoking woods, gas grills do not add any smoke flavor to your food, a big disadvantage if you ask me! The solution is to add real wood smoke flavor by using a smoking box. Because gas grills are not meant to burn wood and collect ash, you cannot and should not add wood directly into your grill. Instead, the metal smoking box holds your wood and allows the rich smoke out to flavor your food. For more information on how to use a smoking wood box and smoking woods in general, see my Smoking Box How To page. 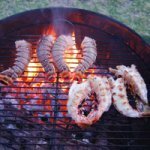 What to look for in a smoker box - First and foremost you want a smoking box which will fit inside your particular gas grill! It is meant to sit under the cooking grate on top of the burners. Check the room in your grill before purchasing a smoking box. Try to find a smoker box which is the largest that will fit comfortably in your grill because you can add more wood, which means more smoke which will last longer for those marathon grilling parties. Also, you can fit larger wood chips or even chunks in some large smoking boxes. For most smaller boxes, you will need to use only smoking wood chips. Finally, some grills have specially designed smoking wood boxes that are built to fit that grill exactly or even has hooks to hold it in place. 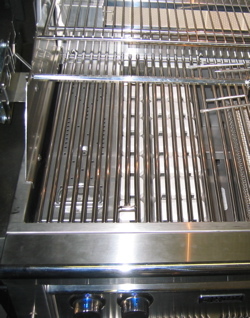 An example is the long box visible in the picture at the top of this page of a Lynx gas grill (on the left under the grill grate). Some higher end grills, like the Lynx, include the smoker box in the purchase of the grill. Well thats it! Go find yourself a smoker box and enjoy the richly flavored barbecued foods. Again, check out my other pages for more info on choosing smoking wood types and cooking with smoking woods. Grills Direct - Virtually every major brand of grills, barbecues, fryers and smokers. 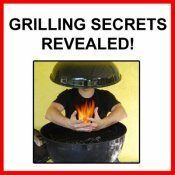 Whether charcoal, electric, portable or permanent, find your grill here! Fire Pit Shop - Big selection and great prices on all types of fire pits, chimineas and accessories. If you are looking for a firepit, this is the place to start! SpitJack - Tools for Food & Fire! Specializing in fireplace grills, rotisseries, other fireplace cooking accessories and outdoor spit cooking. Also a great selection of fire pits, grills, smokers, firewood storage. 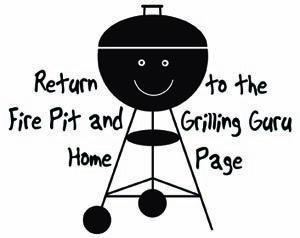 return to the Grill Accessories page.